Bastrop County is the perfect place to plant your roots and make a home. Close enough to Austin to participate in city life, but far enough to stake out a beautiful and large piece of land, we at Graham Construction & Land Clearing are the partners you’ve been looking for. We have site work experts, like excavating contractors, underground utility contractors, septic installation specialists and land clearing crews. We have a team of professionals to build, maintain, and improve your property, whether you are a private owner or looking to develop the land for commercial projects. Living in the Historic Triangle means getting a front row seat to the rich upbringing of the great state of Texas, truly making Bastrop, Elgin, and Smithville part a lovely county. Not only does Bastrop County illustrate a rich Texas history, it boasts beautiful piney woods great for raising livestock or for hunting and fishing. 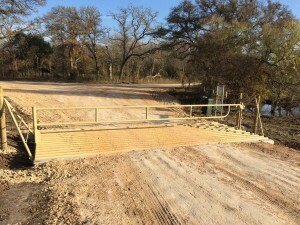 We will help you utilize your privately owned or commercial land in Bastrop County to develop a space that will make you Texas proud- just look at some of the work we’ve done by viewing our gallery. Land clearing is easy when you have the proper tools, when you know exactly what to do, and when you don’t have to do it yourself. That’s what makes us the go-to for expert land clearing. You may have several different tree species growing on your property, from Mesquite to Pine. Not all trees can effectively be removed in the same way. Save time and money by letting us clear your land right the first time. Site work is consistently needed on ranches, farms, and all other types of land in need of development. Land clearing and ranch fencing aren’t the only concerns when maintaining property in Bastrop County. Developers often need excavating contractors and underground utility contractors- we can do this and much more. There are many ways to enhance a property. In any case, we’re the reliable crew to give you fair and honest work. It takes a lot more than just initiative to get a septic tank installed on your property. There’s paperwork and permits and plenty of red tape to get through as well. We know how to manage a proper septic installation in Bastrop County. Instead of missing out on time you could be spending enjoying and relaxing on your land, let us handle the mess. Have a large project for your commercial interest? We’ll be the ones you can trust to get the installation done right. There’s nothing more useful than having the right space to house your belongings, or structures to increase the value of the property. Whether you need a shelter for your livestock, a shed for your tools, or a sturdy space for your equipment, we custom design metal buildings that will protect against the strong Bastrop County weather. A sturdy fence goes a long way. If you want a good-looking fence to surround your good-looking property, need a practical fence to keep animals in or out, or are looking for something that does both- give us a call. Ranch Fencing is something worth investing in and our craftsmanship cannot be beat. It’s easy to be proud of where you come from when it’s Bastrop County. The history is rich and the people are fearless. It’s that same strength that we at Graham Construction & Land Clearing put into our work, whether you’re in need of excavating contractors or underground utility contractors or any other type of site work including septic installation and land clearing. We specialize in large commercial projects and look forward to providing the groundwork to improve your investment. Contact us today and we’ll take care of your land.